For readers of The Paris Wife and The Swans of Fifth Avenue comes a “sensuous, captivating account of a forbidden affair between two women” (People)—Eleanor Roosevelt and “first friend” Lorena Hickok. Lorena Hickok meets Eleanor Roosevelt in 1932 while reporting on Franklin Roosevelt’s first presidential campaign. Having grown up worse than poor in South Dakota and reinvented herself as the most prominent woman reporter in America, “Hick,” as she’s known to her friends and admirers, is not quite instantly charmed by the idealistic, patrician Eleanor. But then, as her connection with the future first lady deepens into intimacy, what begins as a powerful passion matures into a lasting love, and a life that Hick never expected to have. She moves into the White House, where her status as “first friend” is an open secret, as are FDR’s own lovers. After she takes a job in the Roosevelt administration, promoting and protecting both Roosevelts, she comes to know Franklin not only as a great president but as a complicated rival and an irresistible friend, capable of changing lives even after his death. Through it all, even as Hick’s bond with Eleanor is tested by forces both extraordinary and common, and as she grows as a woman and a writer, she never loses sight of the love of her life. 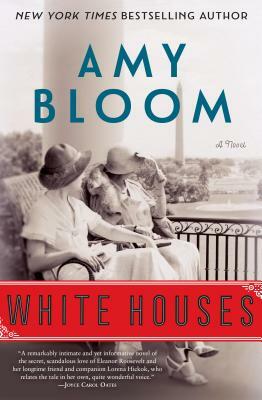 From Washington, D.C. to Hyde Park, from a little white house on Long Island to an apartment on Manhattan’s Washington Square, Amy Bloom’s new novel moves elegantly through fascinating places and times, written in compelling prose and with emotional depth, wit, and acuity. Amy Bloom is the author of Come to Me, a National Book Award finalist; A Blind Man Can See How Much I Love You, nominated for the National Book Critics Circle Award; Love Invents Us; Normal; Away, a New York Times bestseller; Where the God of Love Hangs Out; and Lucky Us, a New York Times bestseller. Her stories have appeared in The Best American Short Stories, O. Henry Prize Short Stories, The Scribner Anthology of Contemporary Short Fiction, and many other anthologies here and abroad. She has written for The New Yorker, The New York Times Magazine, The Atlantic Monthly, Vogue, O: The Oprah Magazine, Slate, Tin House, and Salon, among other publications, and has won a National Magazine Award. She is the Shapiro-Silverberg Professor of Creative Writing at Wesleyan University.